For high school seniors, deciding where to go to college is one of the hardest decisions they have to make. Some knew right away where they wanted to go. 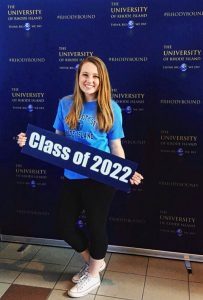 For others, like freshman Siobhan Richards, more research had to be done before choosing which college to attend. Richards, a public relations and history major from Hudson, Massachusetts, knew she wanted to major in PR after attending many journalism and PR conferences. With the Harrington School sitting in the back of her mind, Richards was torn between two schools she knew would further her love for PR. As decision day approached, she decided to sit down and compare the two schools. She dove into the websites for each schools, the degree requirements, anything that could help her make a decision. Finally, she knew URI and the Harrington School was the place she wanted to be. Before coming to URI, Richards attended Hudson High School where she was able to take journalism courses every year. She even helped develop Advanced Journalism IV, which she took her senior year. She was also an editor and photographer for the school’s newspaper, The Big Red. Richards is already making a name for herself at URI. She is an active member of PRSSA and currently serves as the group’s historian on the executive board. She oversees the retention committee, which keeps members invested in the club and promotes the chapter’s brand. She hopes to get even more involved in the future.